The broccoli, cabbage and swede plants were beginning to outgrow the corner of the greenhouse bed which I have been using as their nursery. They were looking very good and I knew it would take a while to transplant them all. I decided that today was the day. First I had to clear the bed they were going into of weeds, then I spread some of last September's chicken manure over the area. Just doing that took about an hour. 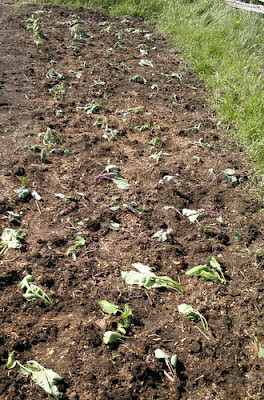 Then I carefully dug up the young plants, separated them and transferred them into the new bed. That took over an hour. I feel like I've murdered them all. This evening I've given them a thorough watering-in and there's some good rain in the forecast for tomorrow night. I hope that will be enough to perk them up a bit. Once they're back in a more upright stance I'll spread some grass-cuttings around them as a mulch to keep down some of the weeds. I'm hoping this will be a better year for brassicas than last year was - even if it doesn't look terribly promising right now. A few cloudy days and a few light waterings, and I am sure they will 'smarten' up nicely!